Task Status Field in Project Plan Template - ANALYSISTABS - Innovating Awesome Tools for Data Analysis! Status of a task indicate the progress of the task. Status of the Task Labels are Open, In Progress, Completed, On Hold, Cancelled, etc. Status of a Task is a required field and it is a string data type Field. Combo box is used to add list of Status Labels (Open, In Progress, Completed, On Hold, Cancelled, etc.) and Select one item. Here are few more characters of the status of a Task in the Project Plan Templates. Open status Tasks are Tasks just assigned and not yet started. In Progress Status Tasks are Tasks are currently under development and resource is working on tasks (%Progress >=1 and <=99%). Completed Tasks are Tasks which are completed (%Progress=100%). On Hold Tasks are Tasks which are stopped and waiting for further communication (%Progress >=0 and <=99%). 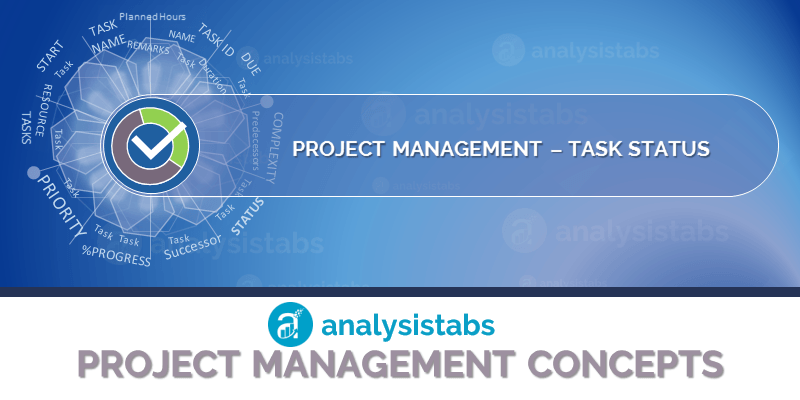 Cancelled Tasks are Tasks which are cancelled by the Client or Project Teams (%Progress >=0 and <=99%).